I pride myself on my personal service. My customers are the most important part of my business and the best payment I can ever receive is knowing that they are happy. Nothing is too much, and I will always do everything I can to make sure my customers have a brilliant trip. Sanjeewa is a fully qualified chauffeur, tour-guide and lecturer for the entire island and has been working as a guide and driver for the last 7 years. 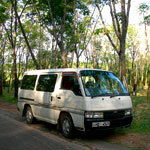 His licence number, issued by the Sri Lanka Tourist Board is C-1048. In addition to his qualifications and his in-depth knowledge of his country, Sanjeewa has an ever expanding network of restauranteurs, hoteliers, guides and other people working in the tourist industry. This network means that Sanjeewa can always cater for his customers needs, get good prices for services and make your trip go as smoothly as possible. Sanjeewa's mini-van is a Nissan Caravan, which seats 6 passengers. It is spacious and efficient. But more than that, the seats have been re-upholstered for extra comfort and it has dual air conditioning, independently controlled from the front and rear. It has more than enough space for luggage and shopping and there's even a selection of modern Sri Lankan music should you need entertainment! The vehicle is comfortable, reliable and ideally suited to Sri Lankan roads. 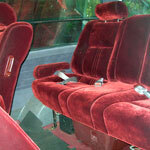 The seats are luxuriously upholstered, reclinable and have armrests too. There's loads of room, which means you can stretch out and make yourself at home. The high driving position afforded by this kind of vehicle means that driving is safer and you'll also see more during your trip. And rest assured, while driving on Sri Lankan roads can by a bit dicey, Sanjeewa is experienced and will always be cautious in order to stay safe. 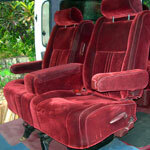 So sit back in the luxurious surroundings of Sanjeewa's van and see Sri Lanka in style! It's best to contact Sanjeewa before you travel, so he can make sure there is enough time to fit everything in to your timescale. 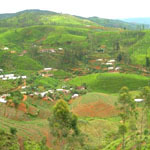 Once you have contacted Sanjeewa, he will come to meet you in a place of your choice, which can be anywhere in Sri Lanka. He can meet you straight from the airport, or at your resort – it's up to you. You will sit down with him and plan your tour together. You can request particular things to see and do, and Sanjeewa will have some good ideas for you as well. Once you have created your personalised itinerary, you will agree a starting day and a price. Costs are all agreed beforehand, so there are no surprises. Sanjeewa will be able to help you factor in costs such as accommodation, entry to attractions and so on, so that you can easily assess the total cost of the trip. Guides for the attractions can be organised in advance by Sanjeewa, or you can visit them on your own, again it's up to you. For many places, Sanjeewa can be your guide too – just ask! Once you are happy with your itinerary, Sanjeewa will pick you up in the mini-van at the agreed time and away you go. Starting in Unawatuna, on the south west coast, most of day 1 is a drive along the south coast road. You would stop for a traditional Sri Lankan lunch, and arrive in Tissamaharama with plenty of time to unload your luggage at the hotel and freshen up. The Safari Jeep meets you at the hotel and you make the 40 minute journey from the centre of Tissa to the entrance to the park. The 3 hour safari in the back of the jeep takes in the majority of the accessible areas of the park. 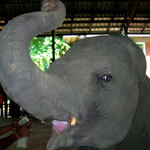 The driver will be one of Sanjeewa’s regulars, someone who knows where to spot the animals. 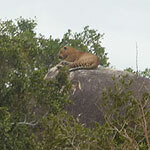 You'll be likely to see elephants, eagles, wild boar, crocodiles and jackals, and if you're very lucky, a leopard! A shorter drive north into the beginning of the high country. During the whole trip Sanjeewa will stop at towns and villages to allow you to sample local produce and see sights along the way. You have lunch in a café next to an enormous and spectacular waterfall, while chatting to Sanjeewa about the country and its culture. You'll arrive at Ella in time to experience one of the area's specialities – an Ayurvedic spa treatment, comprising herbal massages, steam rooms and sauna. Again, Sanjeewa knows the best place and will get you a good deal too. The day begins very early with a train ride through the mountains. The particular train route is famous because it offers the best views of the high country – far better than the road. You'll get off the train at Nurwara Eliya and begin the drive through the tea country. You stop at as many plantations as you like, and have guided tours of the factories. The guides will explain each part of the process, from tea tree leaves to boxed tea, and we get a chance to taste it and buy lots! You'll arrive at the hotel in Kandy with enough time to freshen up, then straight into town to watch a show of traditional Sri Lankan dancing and fire walking. You'll then join the guide Sanjeewa has booked for your visit to the temple of the tooth. 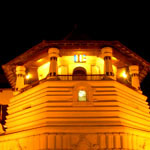 After the tour you can have dinner in Kandy, where there is a huge choice. Sigiriya - The scenery is spectacular and the climb is worth it! 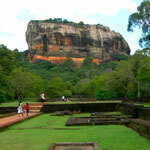 Sigiriya is one of Sri Lanka’s most sacred and spectacular landmarks. On the way you'll visit a spice garden where you'll have a guided tour of the various spices and plants used in traditional medicine. You can buy a selection of spices, remedies and creams from the shop. Sigiriya is another few hours’ drive. Sanjeewa will drop you at the entrance and pick you up at the end. The climb to the top of the rock takes about an hour and a half, but you can take your time. The views are spectacular at the top. After Sigiriya, you'll drive back to Kandy for dinner and a well earned rest. You'll not get any closer to an elephant than this! You begin your drive back to Unawatuna. On the way you can stop at the elephant orphanage, where visitors can meet the elephants, and watch their morning bath in the river, which is amazing. The drive back to Unawatuna takes about 7 hours. You can download a map of the island showing this example tour here or from the links panel at the top right of this page.